Though the comparison may seem unorthodox, brands and parents share some important traits. For one, brands, like parents, have a serious responsibility over the knowledge they pass down to their consumers (children? Okay, maybe it’s a stretch). Next, both brands and parents try to create a healthy relationship founded on trust. Finally, both brands and parents risk embarrassing themselves when they carelessly use modern terminology they do not understand. Children will cringe from the social awkwardness of their parents, while audiences will click out and harshly judge brands’ transparent attempts to be “cool”. To be successful on Tumblr is something akin to being the popular kid in school, without the “mean girl” attributes. Unlike other social media platforms, follower counts are hardly ever discussed or shown–meaning that it is not a true criteria for success–but interactions in the form of asks, replies and reblogs are highly desired. To be popular on Tumblr requires a certain level of creativity, humor, knowledge of Tumblr lingo, and a certain something that sets you apart, and once that popular status is achieved you find yourself connected to a community of like-minded peers who will be there to support you. Sounds great, right? With millions of unique visitors, 66% of whom are under the age of 35 and 35% of whom earn over $50,000 annually, that kind of reach and engagement would be highly attractive for startup brands with similar demographic targeting. To get any sort of respect on the site, however, requires a type of understanding that platforms like Facebook or Instagram do not. 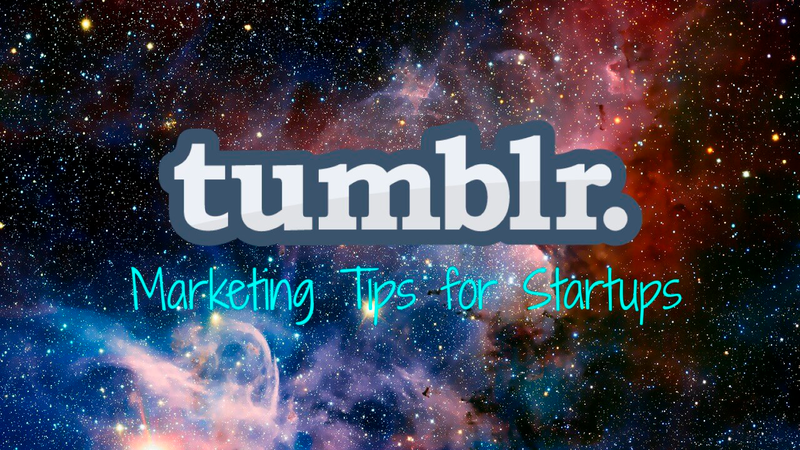 In order to avoid sounding like an out-of-touch parent, we suggest you follow our tips on Tumblr marketing. After creating your account on Tumblr you will have to go through a–perhaps unexpectedly–difficult process: naming your blog. Coming up with a snazzy name that gets your blog’s point across is the first step you can take towards branding your blog. It might sound logical to just make it the company’s name–don’t. Your blog’s name should be part of your strategy. Presumably, you will have already decided on the kind of message you want to get across through your blog, more than simply getting your name out there. That blog name will quickly introduce others to that message and what your brand stands for. Plus, people on tumblr appreciate funny/unique names. And, yes, they love puns. Design fans, rejoice. Tumblr actually lets you decide how your blog will look, giving startups another way to define their brand. If you’ve got the time and resources, it could very well be worth it to get a designer to make you a nifty-looking theme for your blog. If hiring a designer or doing the designing by yourself is not possible, that’s not necessarily a problem. There’s plenty of free/inexpensive pre-made themes to choose from provided by Tumblr. They won’t be as unique, but you could adjust the theme to suit your brand. Just try to keep it clean–your theme shouldn’t take the attention away from your posts. Tumblr loves its images, and it’s no secret. A study by Yahoo Labs took a sample of 586.4 million tumblr posts, broke them down by category, and showed that 78.11% of posts made on tumblr are photos. This is not to say you should shy away from text posts, audio posts and the like. Tumblr is different from many other sites in that its audience really doesn’t shy away from words, with text posts being the next biggest post category behind photos. However, graphics are warmly received and they do get reblogged the most. Ah, memes. You can’t scroll Tumblr without hitting at least one. They’re the internet’s inside jokes, and new ones appear by the minute. Learn which ones are big right now, their backstory, and how to use them. If you’re feeling particularly clever, take a stab at making a new one, but only if it’s genuinely funny. There’s no sure way to tell if a meme will go viral or not, or even how long it will take before that meme will get big, or if an old meme will come back around again. It’s a bit like winning the lottery, but if you make it, you’ll see the notifications (and subsequent glory) come flooding in. Grumpy Cat, for instance, started out as a simple image of a siamese cat with dwarfism. The cat, named Tardar Sauce, quickly became an internet celebrity, with a whole slew of memes, book deals, merchandise, and a movie. You just never know. Clicking this button and picking the “Trending” section will show you everything from trending searches to trending blogs. Other sections will let you see what Tumblr recommends for you, staff picks, and many other options. Keeping up with popular tags and using them appropriately will be useful, but do try to keep your new content unique instead of flooding that tag’s feed with the same stuff. It’s important not to overuse tags. Using over 5 or so tags will make your posts look inauthentic and spammy, which, as we said in the beginning, is something Tumblr users are very sensitive to. Sure, you can line up posts in a queue and go through your liked posts to reblog, but on Tumblr something new is happening every day–be it a new meme or a viral story. You need to be there to keep up. Besides, if you don’t answer asks as quickly as you can, you will discourage future asks from coming along. Tumblr is simply not a place for autopilot. This might sound counterintuitive to companies, but glaring marketing messages, spammy use of hashtags and repeated mentions of your company and what it does will drive users away. Same goes for constant reposting of content from other platforms your company is on. Tumblr folk still get angry at sponsored posts, and they’re very sensitive to salesy messages. It’s best to be subtle and let the quality of your posts speak for itself. Still confused by the lack of overt promotion? Just remember that Tumblr is another tool to help tie your overall digital/social strategy together. It should not be working alone. If your target group is indeed 18-35 (Tumblr’s primary user base), then the use of the site will help unify your ad and overall brand messaging. Bonus: When in doubt, cats. Tumblr, much like the rest of the internet, has a serious love for cute, fuzzy felines, so don’t hesitate to show your mutual appreciation. We hope our tips have made the world of Tumblr seem more manageable. Have you tried to use Tumblr as a home for your startup? What are some other tips you might offer those just learning about the platform? We’d love to read your comments.